The Gumotex Swing 2 is a tandem version of the Gumotex Swing 1. The Swing 2 is a closed cockpit tandem inflatable kayak for recreational paddling and touring, Ideal on tranquil rivers, lakes and calm, sheltered coastal bays. The Gumotex Swing 2 is a closed cockpit tandem inflatable touring kayak designed for recreational touring paddling on lakes, rivers and calm sheltered open waters. 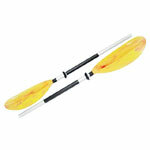 Perfect for day trips out on the water but also more than capable of multi day expeditions as well. 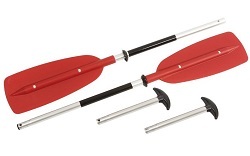 The swing 2 provides good stability on the water so all paddles have a plaform to get on the water. With 2 cockpits, padded seats, easy bow and stern zip storage access and a reinforcement system allowing for easy manourability this really is the perfect go to tandem inflatable. The Gumotex Swing 2 uses Gumotex Nitrilon light to provied great durablilty whislt still allowing this inflatable tandemm kayak to be as light as possible (14.1kg). 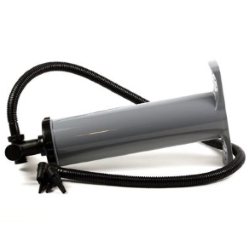 Nitrilon allows inflatables to be more washable and dry much quicker than regular inflatables with nylon style outers. Like the look of the Swing 2 but only looking for a solo? No problems take a look at the Gumotex Swing 1. Unless instructed otherwise, we endeavour to supply the Gumotex Swing 2 in 3-5 working days within the UK mainland. Delivery times are estimates based on years of experience; we do not offer a guaranteed timed delivery service. Our overnight service works well for the core more densely populated areas of the UK for Clothing and Equipment orders. However more remote less densely populated areas will not be covered by a next day service. Buy a Gumotex Swing 2 online from our website and collect from our shop in Hamworthy, Poole or you can collect from any branch within the Canoe Shops Group. There is no cost associated with in-store collection.